Is an LCD screen this size too small? Although the Toshiba 20WLT56 is at the higher end of budget LCD TV territory with its £540 price tag, it looks anything but cheap: its tidy design is a rarity for LCDs of this size and price. That's not the only surprise. Despite this TV not being HD-ready it has component video inputs amongst the usual set of flatscreen sockets. This connection is unusual for a TV of this size and means the 20WLT56 should provide us with a crisp, clean picture. Backing up these gems are two Scarts (one RGB capable), S-video, PC VGA and PC audio inputs. Conventional LCD wisdom that a screen this size is too small to show high-definition in all its glory. Those component video inputs can handle progressive scan pictures from a DVD player, but only support the 720p high-definition format. This is handy for Xbox 360 users, but the TV can't handle HDTV, as it isn't compatible with 1080i broadcasts, nor can it decode the HDCP encryption used to stop unauthorised copying of high-definition programming. Still, these sockets show forward thinking for this size and price. This also applies to the inclusion of a digital TV tuner for receiving Freeview. There's an argument that with the impending shutdown of analogue TV in 2012 these features should be standard in TVs now. We certainly approve of this. Getting the 20WLT56 set up was a walk in the park. Granted, there aren't many features here: the basic onscreen menus revealed little beyond a sleep timer, child lock and language settings. The TV's hidden features include an efficient digital noise reduction system and the ability to play NTSC video - so the set is good for watching Region 1 DVDs. There is also a comb filter to enhance detail. Sonically, there are no special features, but this is to be expected within the price bracket. The remote is user friendly, taking the chore out of basic navigation. Our test DVD of Planet Earth revealed the 20WLT56 to be far above average in terms of picture quality. Such an incredibly detailed programme tests many an LCD TV's mettle, and the widescreen 20WLT56 performed remarkably well. Contrast is on the button when viewed head-on. The viewing angle is also good enough to only cause contrast deterioration when looking at the screen off-centre, although blacks always look a touch grey. Colours and fine detailing are impressive, and during an aerial camera pan over a craggy ravine, the reddish rocks were vibrant and well-rendered. There was a little judder during closeups, but it really isn't enough to become an irritation. Similarly, the picture noise we picked up on is only negligible. 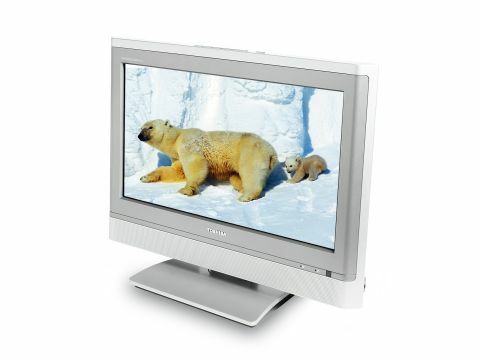 Despite the lack of natty features (audio options are limited to Nicam stereo), sound too is above average, dealing with the myriad noises of the animal kingdom as well as can be expected from an LCD TV of this size.